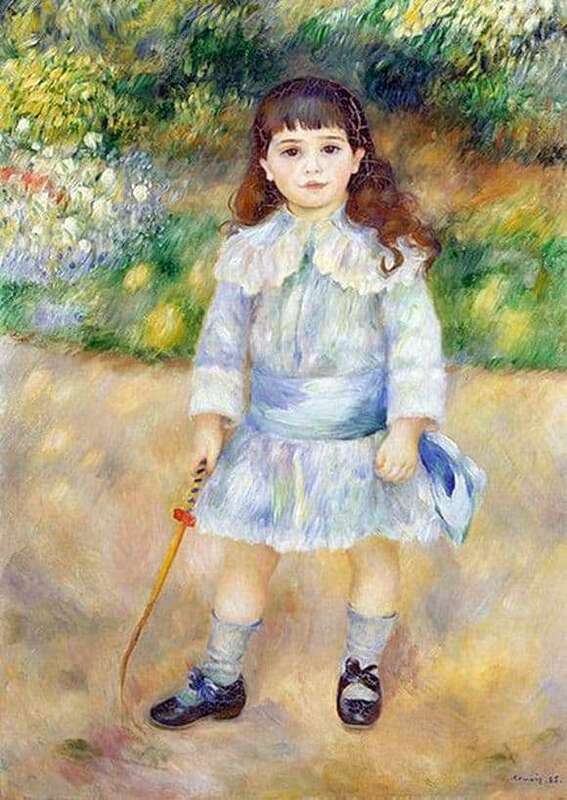 Pierre-Auguste Renoir wrote his picture “A child with a whip” in 1885, at the time when he himself turned 44 years old. At this time, the artist was already an accomplished painter, his paintings were widely known, and everyone recognized the talent. Interestingly, venerable artists either did not paint children’s portraits at all, or their canvases showed reduced adults, without revealing the rich and peculiar world of the child. Renoir wrote children quite differently. Children in his pictures live their own lives, children’s emotions on children’s faces, in the eyes of – curiosity and playfulness inherent in the young age, and the whole canvas does not torment the consciousness with the discrepancy between the written image and the real child. This canvas by Renoir depicts a portrait of a child in full growth. It is seen that the kid from a wealthy family – neat shoes, tied with a bow, socks, light clothes, not holding down movements. But the main thing in the portrait, of course, is not that. Especially the artist singled out the face of the child, writing it with a contrasting reality compared to the clothing itself and the surrounding nature – they are written in light, careless strokes. Contemplating a picture creates the feeling that a small person is waiting for a question or appeal. He was busy with his important affairs – he played with the whip, but he stopped for a moment to find out what these incomprehensible adults want from him. Of course, adults hailed him because of some nonsense, because they do not understand how busy the hero of the picture. That is why children’s lips are so folded and look so tense. Interestingly, the exact answer to the question – who is depicted, a boy or a girl, no. Long curls, dress to the knees, dark shoes – so at the time of writing the picture and dressed girls and boys of this age. However, each answer gives the picture its own shade of what he saw. If the girl in the picture, then it is a small, resolute sovereign. No wonder the whip in her hand, her hair is loose, and the whole pose, and even a clenched fist, speaks of confidence and determination. Such properties are typical for the boy. If this is a boy, then lacy collars, delicate little dress, long curls look contrast. Renoir knew how to intrigue and chain admirers to his creations.